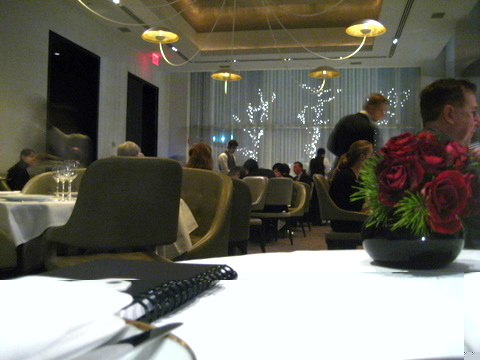 Of all the restaurants we visited in New York, Per Se was the one that excited me the most. 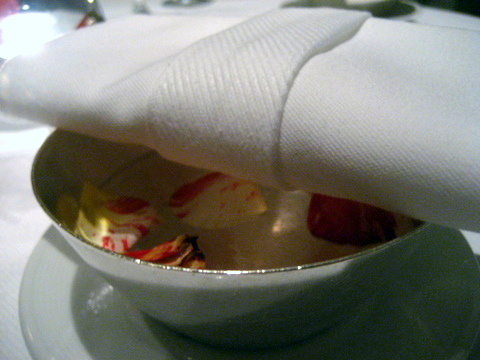 French Laundry was one of the finest meals of my life and I wanted to see how the East Coast version fared. Perhaps that is an unfair label as Per Se is more than a carbon copy of Laundry. The restaurant's conflicting desire to stand apart from its more famous brother while honoring their common roots is evident from the get-go. Outside the restaurant there is a small garden area but more akin to what one would find on a penthouse apartment balcony than a rustic farmhouse. 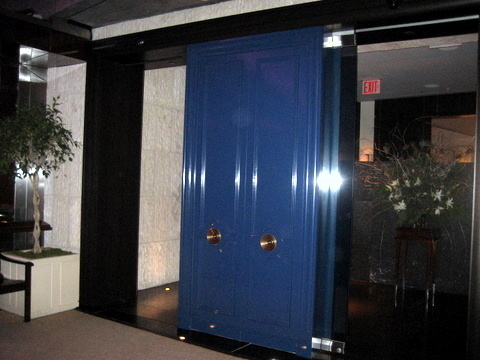 Similarly Laundry's famous blue doors have been replicated but as you walk up it is actually the glass that slides to the side to allow entrance. The interior again follows a more urban theme decorated like a well appointed apartment replete with fireplace and beautiful city views. 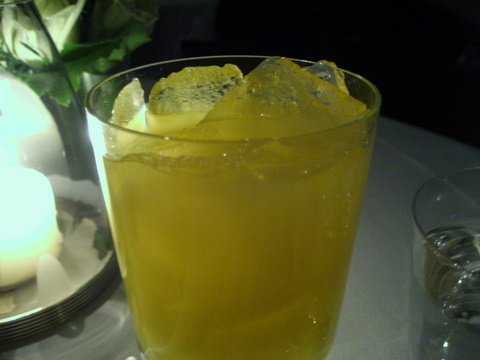 Again illness reduced me to sticking with soft drinks which I believe are complimentary at both French Laundry and Per Se. Crunch down on the airy morsel and you are rewarded with a burst of creamy salty-sweet cheese. Wonderful! 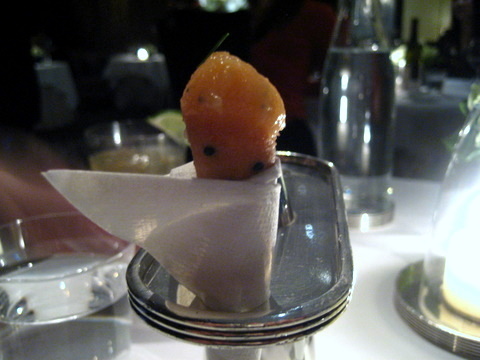 Another staple amuse, the salmon coronet was also a starter at Laundry albeit with a different flavor of crème fraîche. I thought the red onion at Laundry was a more harmonious pairing as the flavor of the sweetbread vied with the salmon for dominance in this course. Unlike our trip to French Laundry, my companion and I selected different menus in order to maximize the number of courses we tasted. Originally we planned to order one Vegetable Menu and one Chef's Menu but during the Fall/Winter seasons the restaurant offers an Offal Menu. Having watched numerous episodes of No Reservations and Bizarre Eats while in New York I've seen how much the hosts praise offal as the best food of any culture. How could we pass up the opportunity to see how Mr. Keller does offal? 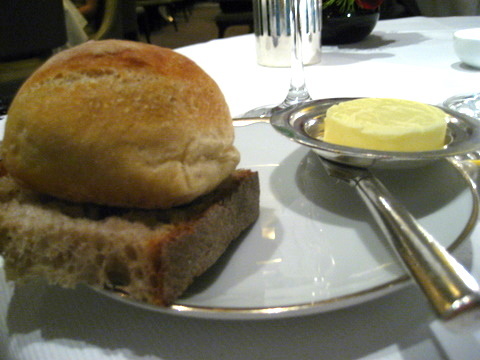 Perhaps the most famous of Chef Keller's signature dishes we had it at French Laundry and I can still remember the experience vividly. The dish has changed little, the Island Creek Oysters are a bit denser and than the Beau Soleils at Laundry and the whole combination felt a bit heavier, still a masterful combination. 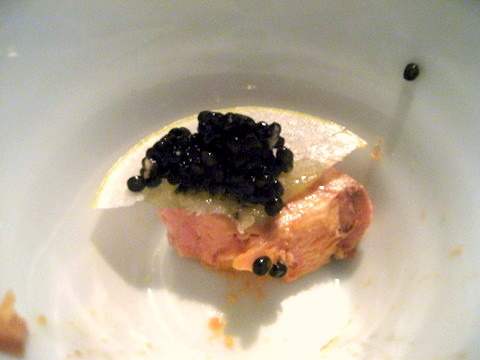 When our waiter explained this was monkfish liver with apple and caviar, I expected something similar to preparations of Ankimo I have tasted in the past. Perhaps the liver was prepared differently, as the initial flavor is a pungent fishiness masking the velvety richness I typically associate with ankimo. 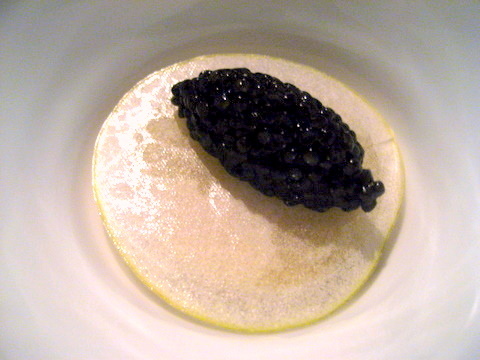 The use of apple added a sweetness that tempered the ankimo allowing for the the buttery flavor of the caviar to come to the fore. For some unfathomable reason the kitchen decided to present us with a most luxurious gift: calf's brain atop scrambled egg with a liberal dose of white truffle shaved from a truffle the size of my fist (the smallest one they had). 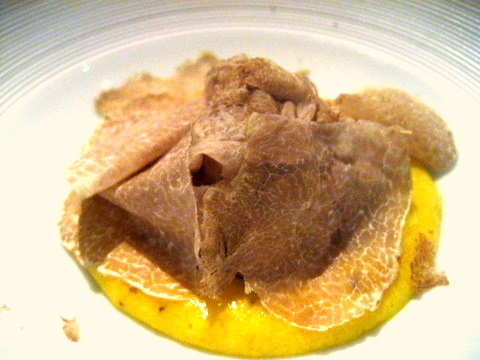 The ethereal perfume of white truffle pairs so perfectly with the soft scrambled eggs. The calf's brain was much softer than what we had at Laundry, with a rounder flavor, it added a sweetbread-like richness to the eggs and truffles. One of the truly stellar courses of the night. 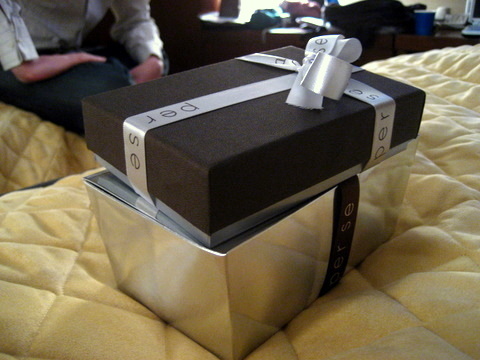 When we asked our waitress she mentioned this gift wasn't given to everybody and implied it was because of our previous trip to Laundry or the 20-course Keller/Achatz dinner (which I inquired about but never went, apparently the restaurant tracks every interaction, slightly intimidating in an Orwellian kind of way). The bread came with two types of butter a fleur de sel butter from Vermont (made by Diane Sinclair exclusively for Keller), and a butter from Straus Family Creamery in California. Given the daunting meal ahead I decided to skip the bread. 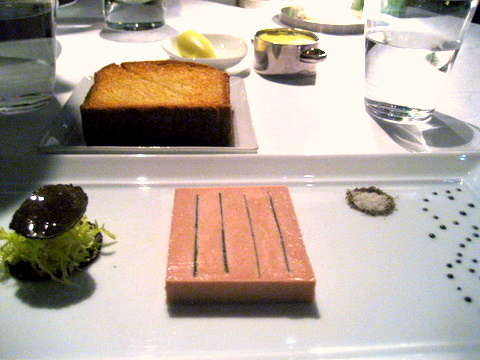 What fortune, the foie gras preparation of the evening was a terrine. In my mind, the terrine at Laundry is the standard all other preparations of foie gras are compared against and I was truly eager to find out how the East Coast cousin would compare. 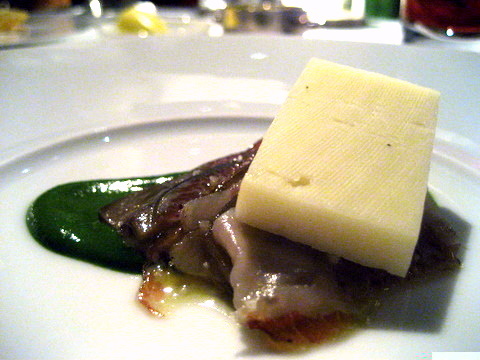 Truly this was a faultless preparation of foie, buttery smooth texture, nicely salted and very rich. 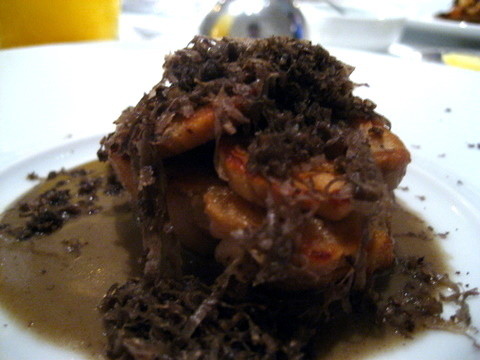 To top it off, Per Se served their foie layered with truffles, in terms of luxury this dominated Laundry. 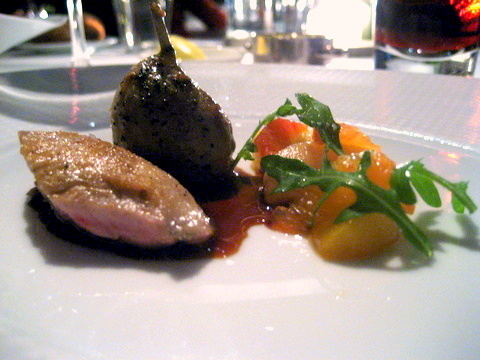 Sadly, the foie gras at Per Se lacked the elan that set the foie gras at Laundry apart from all the rest. My recent experiences with beef tongue have flown in the face of my previous assumptions. The tongue looked almost like ham and had a soft texture somewhere between Kobe beef and gelatin. 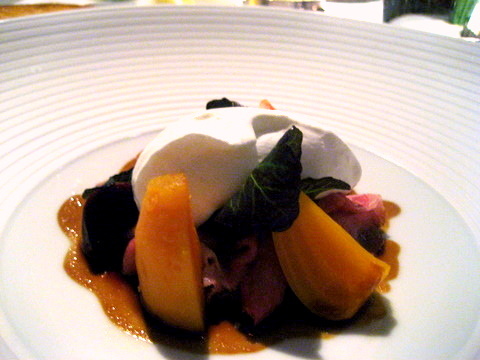 Surprisingly mild, the dish relied on the beets and crème fraîche for a flavor. Chefs Tasting Menu 03: Fillet of Mackerel "Cuit à l'Huile d'Olive" - Saffron Poached Yukon Gold Potatoes, Caramelized Cauliflower and Shallot Shoot with Saffron-Espelette "Aigre-Doux"
The barely cooked fish had a supple texture that belied its oily flavor although the tangy sweet sauce and cooked vegetables deftly attenuated the fishiness of the mackerel. As with all of the preceding courses the best way to enjoy the dish is to take a bit of everything together. This dish had a nice transition of flavors. The skate wing filled with an unidentified stuffing (turned out to be rooster combs) actually reminded me a bit of a Mc Donalds Filet-o-Fish. 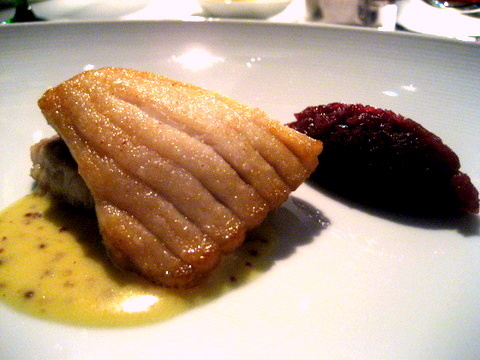 The use of mustard gave a nice tanginess to the skate and the cabbage left a nice undertone of bitterness that lingered. 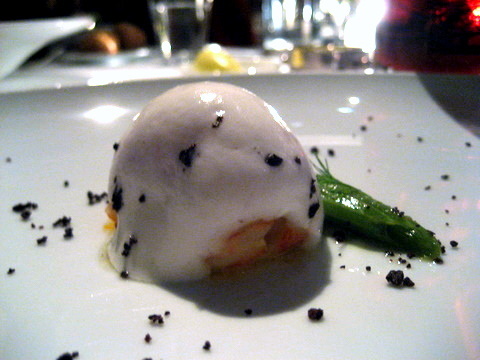 Chefs Tasting Menu 04: Butter Poached Nova Scotia Lobster - Confit of Fennel, Niçoise Olives and "Mousseline des Topinambours"
Like the foie gras, the lobster at Laundry remains one of the highlights of my foodie career. This lobster was surprisingly tough and dull the texture was nothing like what I was expecting. The flavor was also quite forgettable. Very disappointing. Offal Tasting Menu 04: "Trippa Piccata" - Monterey Bay Abalone, Globe Artichokes, Meyer Lemon and Parsley Chips with "Sauce Piccata"
Even though the key ingredient of the dish is the tripe, the abalone was actually more memorable. 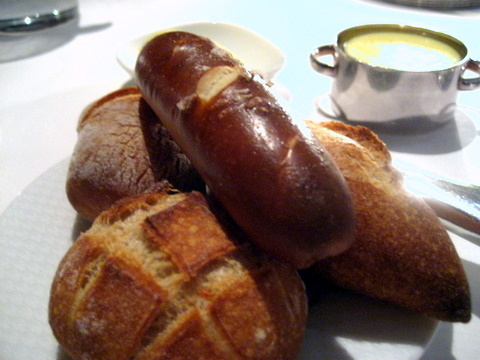 Two large pieces, cooked slowly with a soft even texture and wonderful simplicity. As for the tripe, I couldn't detect much of the characteristic flavor of cow stomach, really the sauteed batter was the most obvious taste. The use of citrus with shellfish is always a safe decision in my book and the tripe benefited quite a bit from the lemon as well. 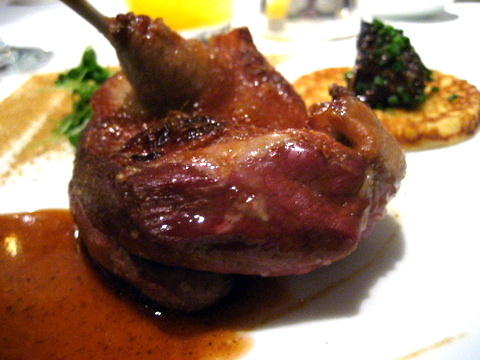 What I thought was a quail leg was actually a sausage shaped like a quail leg, hence the fattiness. This is actually the second time I have been fooled into thinking sausage is quail. There actually was a piece of quail breast that didn't have the richness of the sausage but it was very tender with a satisfying simplicity. This was one of the few courses where the sauce was a distraction from the flavor of the meat. 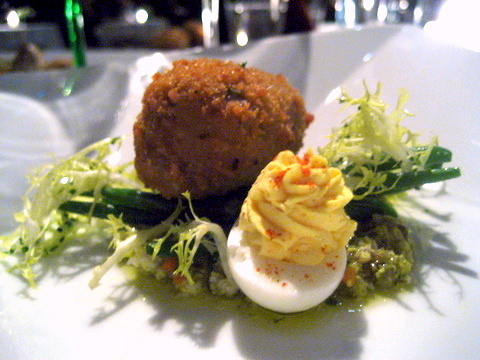 Offal Tasting Menu 05: "Bacon and Eggs" - Crispy Four Story Hill Farm's Pig Tail Deviled Quail Egg, Haricots Verts and Frisée Lettuce with "Sauce Ravigote"
For some reason I thought the pig tail would actually be fatty similar to oxtail but it was very lean and dry, very much like a pulled pork. Lightly flavored, the tail benefited from the tart sauce. The monotony of the "bacon" was broken up nicely by the egg, crunchy haricots verts, and slightly bitter lettuce. I thought this was one of the stronger courses of the night, extremely simple but just brilliant. Perhaps the tenderest lamb meat that I have ever eaten, with the perfect hint of gaminess added onto the savoriness of the meat. 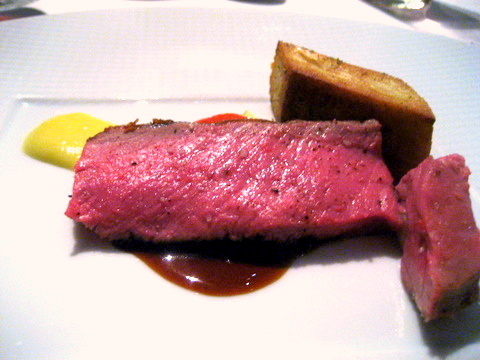 The lemon coulis ran like a tangy jolt of electricity along my tongue, setting off the lamb beautifully. I think at this point the restaurant was running out of offal to serve so they decided to serve lamb neck wrapped around sweetbreads. The result of all day braising left the meat so soft it broke apart at the merest touch. 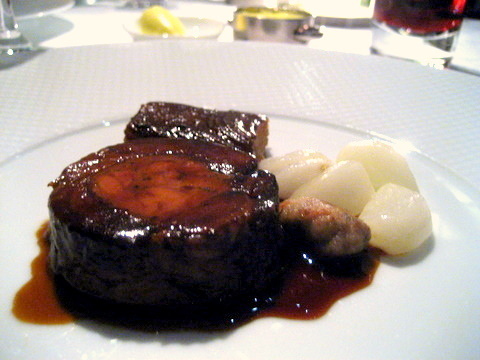 Combining lamb with sweetbreads made for a decadent unctuous meat, a very heavy end to the savory courses. The turnips were fairly bursting with liquid that served to refresh the palate but I didn't care for their slightly bitter flavor. 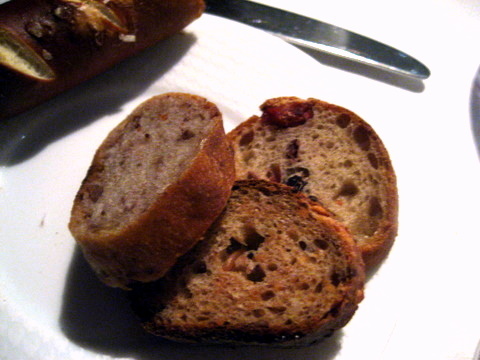 Next came the cheeses served with mustard, cranberry, and pecan bread. 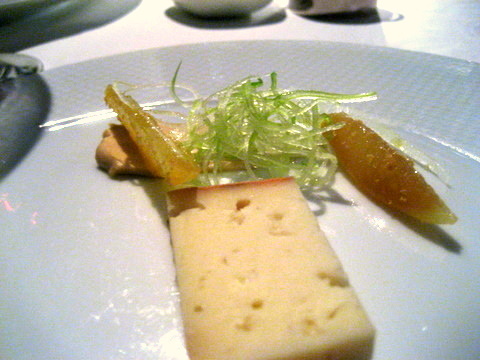 A very mild cheese, fairly firm with a sort of rustic flavor that begged to be paired with the juicy apples and bracing celery. Offal Tasting Menu 07: "Peccorino Pepato" - Salumeria Biellese "Guanciale," Confit of Eggplant and "Salsa Verde"
Another mild cheese, although I did pick up some notes of pepper at the end. The pairing of what was effectively bacon and eggplant made this a bit more savory than most cheese courses. 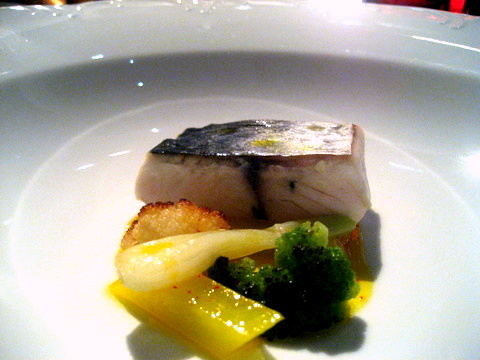 Still I liked the dish even when taken with the bold "Salsa Verde". I immediately detected intense vanilla and medicinal notes layered in with the fruit. My companion humorously remarked it was like a "scented candle." I was really expecting something more acidic and tart but I suppose I shouldn't be surprised Per Se didn't choose such an obvious and one-dimensional route. Showing some the foie's characteristic fattiness, the raisins served as a wonderfully sweet accompaniment, reminiscent of the pairings found in a savory foie gras. My companion thought the dish a bit odd, but I admired how the kitchen adroitly used the fat of the liver to basically make an ice cream. A bit heavy for a palate cleanser but still managed to be quite refreshing. I wasn't sure what to make of this course. Almost a bit too busy for its own good, the disparate flavors and textures never really meshed well. I have to hand it to the kitchen, even the desserts have some form of offal in them. 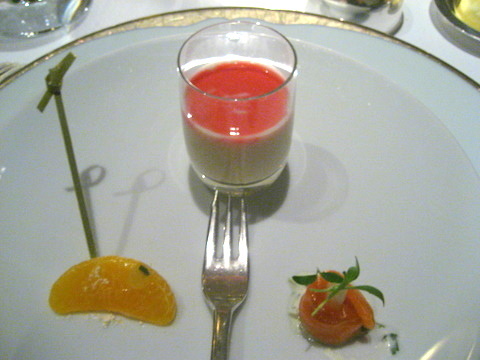 Despite typically being ingredients in savory courses they manage to use the ingredients effectively even in the desserts. Unsurprisingly the four spice ice cream provides the majority of the flavor. 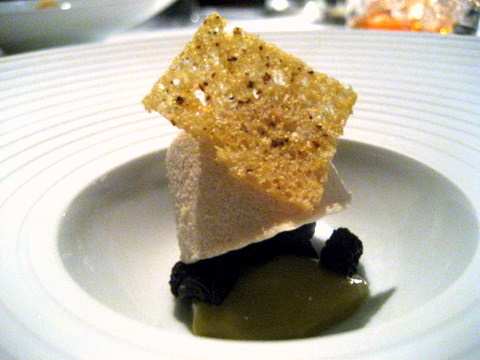 I really liked the crumbly texture of the bone marrow and how it contrasted nicely with the creamier elements. 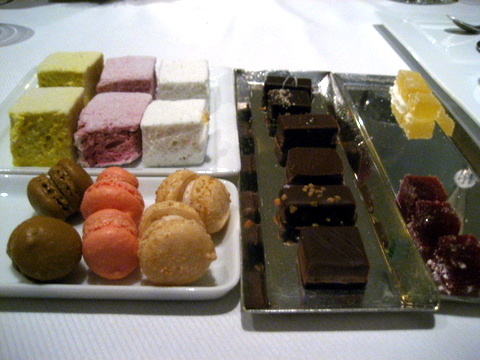 With the official end of the meal, we steeled ourselves for the onslaught of sweets that passes for mignardises at French Laundry and Per Se. The yogurt was slightly tart but definitely took a backseat to the sweet vibrant fruit of the jam. Yoplait should package this stuff and sell it, they'd make a killing. We took one of each chocolate just to taste. All quite good but nothing particularly noteworthy. A very traditional pairing chocolate and hazelnuts, nothing wrong with it per se, but I prefered the hard caramel covered macadamias at Laundry. 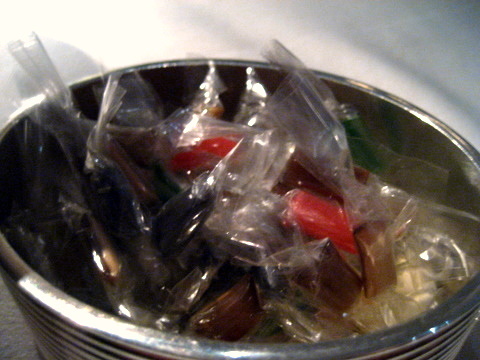 A variety of tiny hard candies. By this point I think we had too many sweets to really distinguish the flavor. Given these were individually wrapped, my companion and I wondered if they just reused the leftovers. I almost don't know what to call this, other than that damn heavy jar. 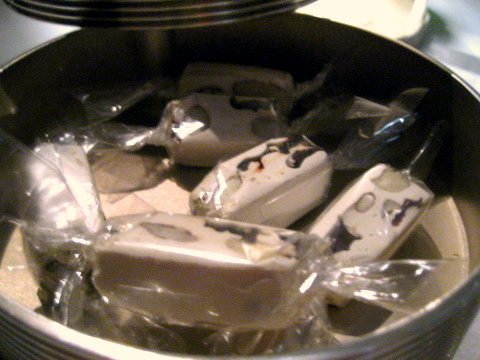 It came filled with walnut-cherry nougat, salted caramel, and house made truffles. 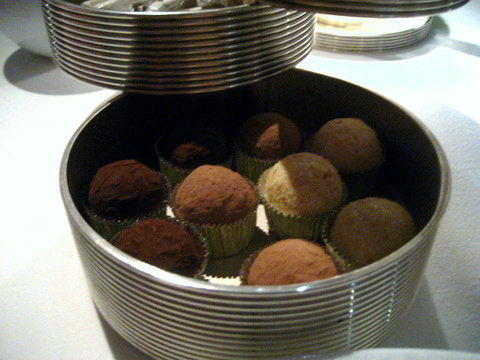 The truffles were definitely the standout each with its own charms. The white chocolate with coconut was incredibly sweet with the coconut shavings providing a gritty textural contrast. The milk chocolate with caramel had a wonderful sweet-salty balance. 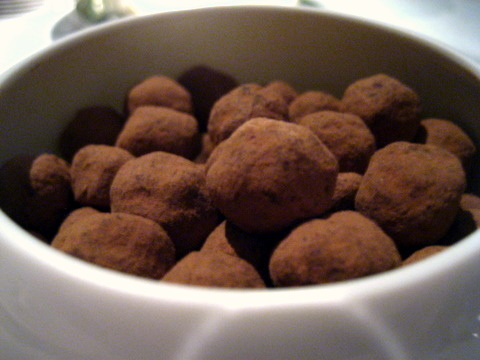 Lastly the Amedei dark chocolate truffle gave off complex fruit and coffee notes. 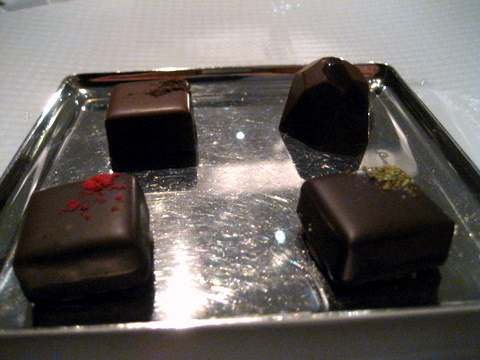 After trying the truffles we asked to take some chocolates home and were given two boxes in lieu of the typical gift of cookies. 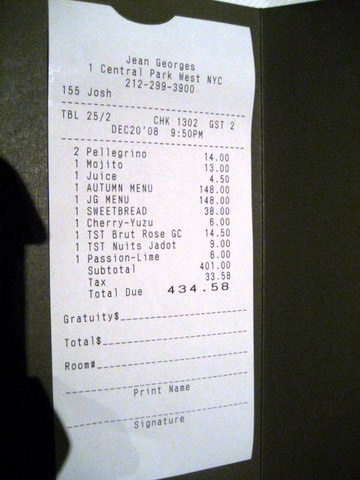 Easily the best of the three restaurants we dined at in New York. 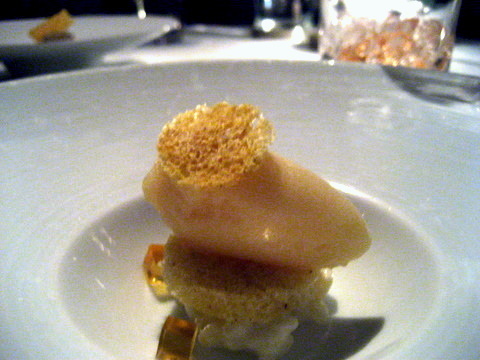 The real question is how does Per Se stack up to French Laundry? I'd have to say it was a valiant effort but in the end it does fall a bit short. The courses are among the most well-developed I have ever eaten. In many dishes, eating everything together fundamentally changed the way the dish tasted, mostly for the better. This suggests a deep understanding of the individual ingredients and how they work together. Still for all the technical proficiency the food didn't move me the way Laundry did. 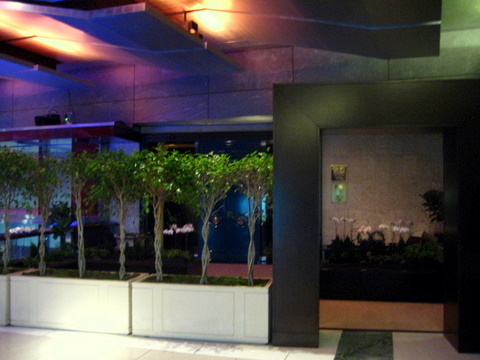 Jean-Georges Vongerichten is a veritable institution in New York with 8 restaurants in the city serving a varied mix of cuisines from French to Thai. His restaurants have garnered a number of awards with 5 Michelin stars in New York City alone. Naturally we had to try his eponymous 3-star flagship Jean-Georges. 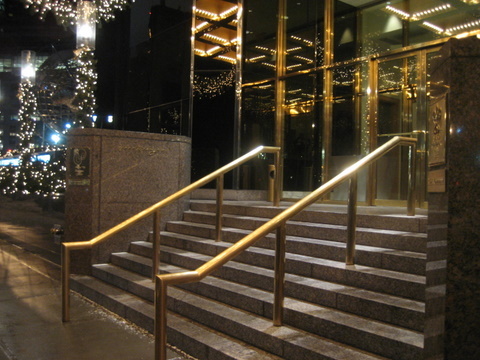 The restaurant is located adjacent to Central Park in Trump International Hotel and Tower. The dining room reminded me very much of Tru in Chicago, with its spartan elegance and generous spacing between tables, offering each table a comfortable and private experience. Off to the side there actually another of Jean Georges restaurants, the more casual bar/café, Nougatine. 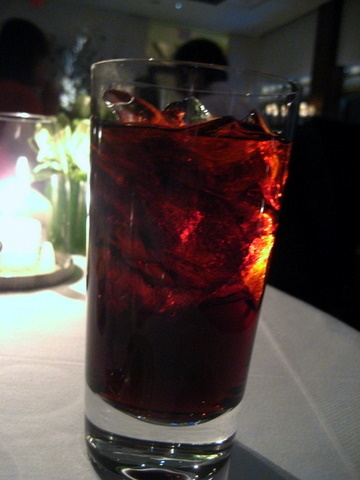 Still suffering from an upset stomach, I decided to go with soft drinks rather than wine. 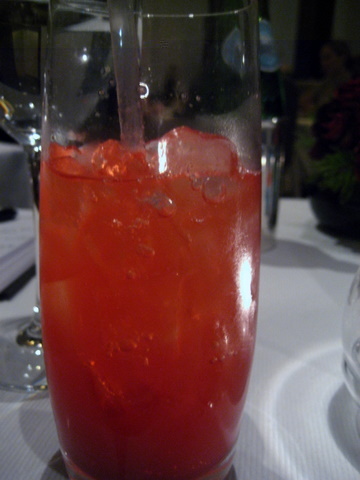 I started with the cherry-yuzu which was extremely good on its own but a bit too sweet for pairing with food. 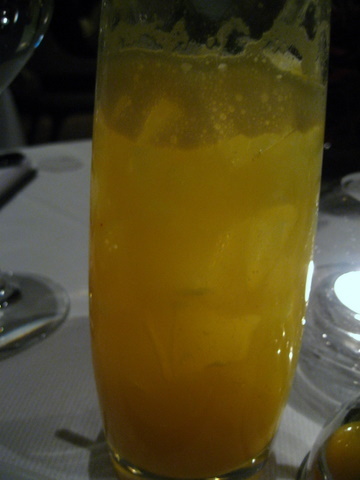 The passion fruit-lime was a bit more floral and tangy and more amenable to drinking with food. 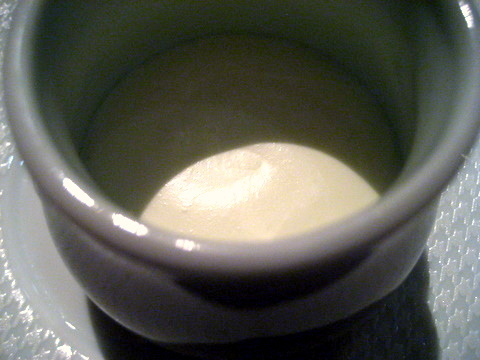 Cauliflower Hibiscus Soup - There is an initial creaminess that gives way to the tartness of the hibiscus. The final flavor actually reminded me of taco sauce of all things. Smoked Salmon with Cilantro Creme Fraiche - Very refreshing use of cilantro and creme fraiche, the fish itself is fairly light but left a lingering fishiness on the palate. Clementine - Not really sure what this was supposed to be, looked like a slice of tangerine with a tart bitterness and an unidentified sphere on top, a very effective way to clear the lingering fishiness from my throat. A fairly typical selection of bread. Nothing particularly exciting or disappointing. 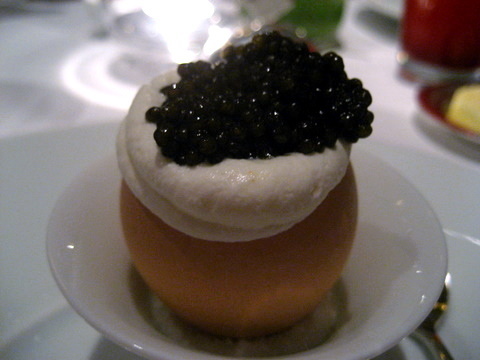 I still haven't had a bad Oeuf a la Coque, I love the slightly cooked runny white and the warm liquid yolk especially when topped with salty caviar and creme fraiche. 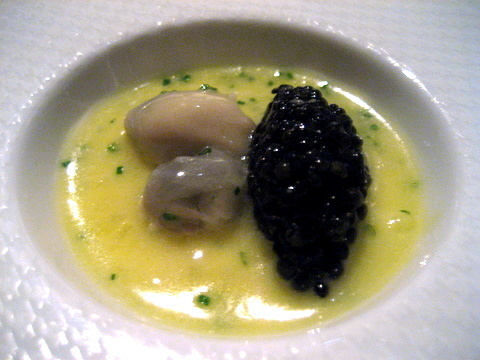 This was a fairly typically egg caviar but added a spicy kick to the creme fraiche for a nice tongue tingling warmth. Similar ingredients yet a totally different course. The egg yolk was firm but yielded a nice creaminess. 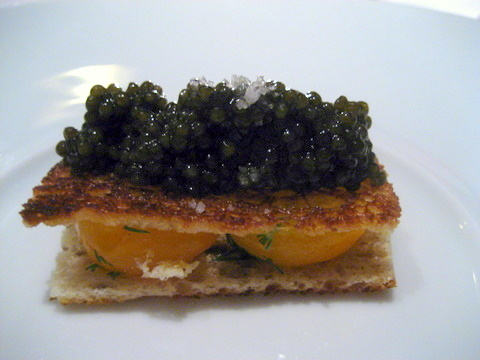 The milder caviar is apparent but still lets the egg yolk and dill contribute to the course as well. Considering I am not a fan of capers or raisins this turned out far better than I had expected. 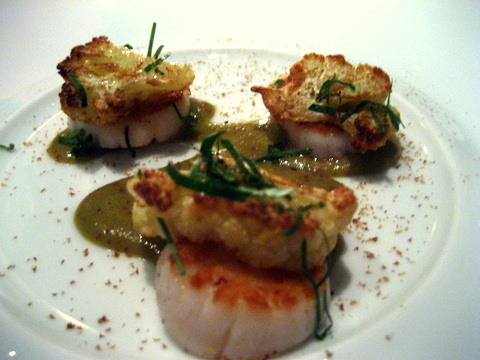 The scallops were cooked to a meaty firmness and got a slight bitter kick from the cauliflower that went well with the tangy emulsion. The flavor of the kanpachi is totally lost in this dish, smothered by the powerful sherry and toasted pecans. The pecan powder gave an interesting texture almost dry and sandy initially, chewing created this kind of pasty gel texture, interesting but not particularly enjoyable. 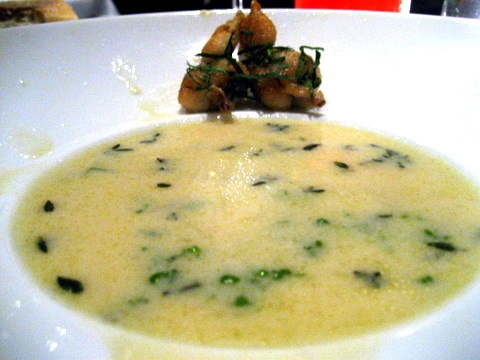 The young garlic soup had a bold taste of garlic but not so powerful that the soup was one dimensional. My companion enjoyed the frog legs but I thought they were overdone, resulting in a tough and stringy texture with an apparent fishy character. The risotto had a wonderful aromatic flavor from the blend of five herbs and a nice earthiness from the porcini too bad the texture didn't live up to the flavor. 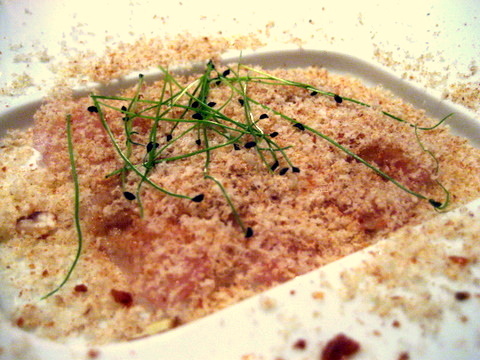 The rice itself is termed "medium-grain" and has a wide variety of uses from sake to sushi. 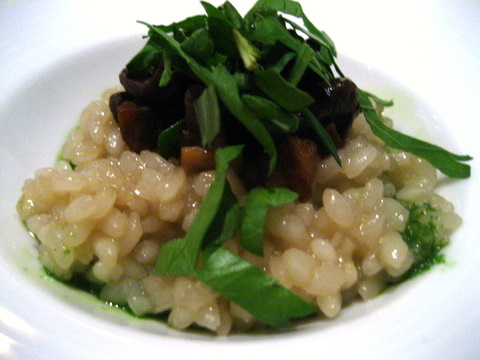 I thought the cooking of the risotto was uneven, some of it was soft and sticky while other grains were hard and gritty almost as if they hadn't been thoroughly cooked. 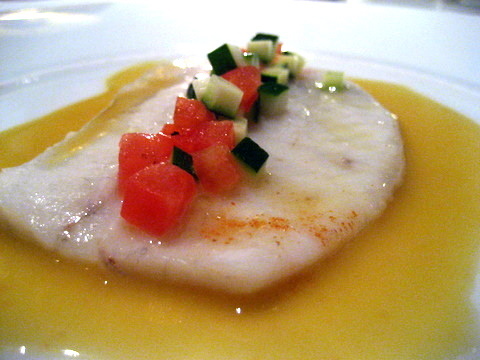 A very light course, the fish came topped with zucchini and tomatoes and served with a light wine sauce. I thought this dish was a bit bland and the sauce had an eggy note to it that I didn't really care for. One of the most disappointing courses of the night. The bass looked like it would have crispy skin but it came out soft, sticky, and slightly fishy. 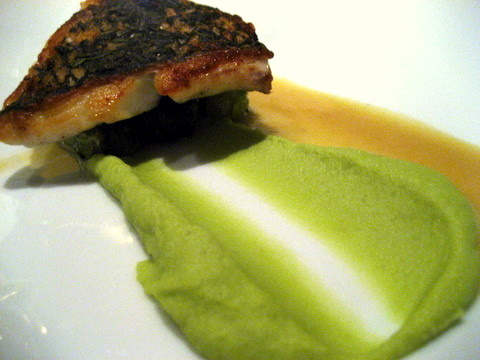 The fish itself was bland but firm and really needed the sauce to give it flavor. 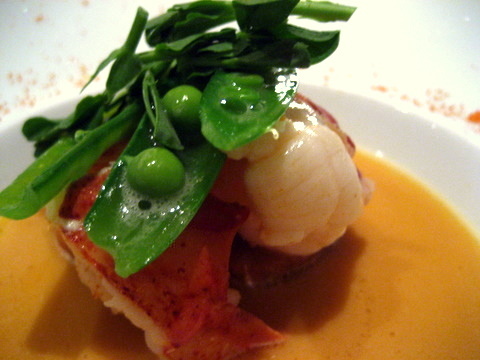 The lobster had a nice supple crunch to it complimented by the light sweetness of the barely cooked pea shoots. The use of lemongrass and fenugreek gave the lobster a nice exotic spiciness. The lobster was a touch overdone but the spongy gnocchi served as a nice canvas soaking up the rich smoky butter. 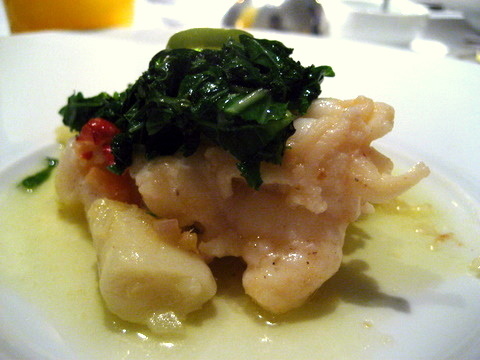 The pickled chilies were a bit too strong in my opinion overwhelming the natural flavor of the greens and the lobster. I was looking forward to this dish but the sweetbreads were a touch to lean and gamy for my liking. I expected something more tender and more richness. 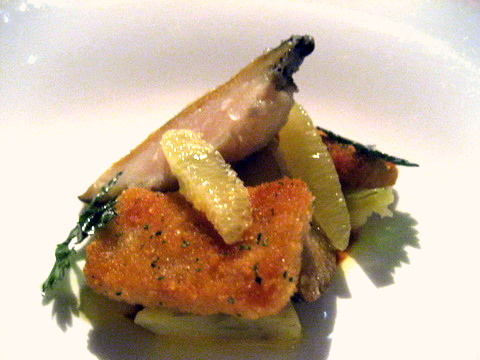 The sweetness of the chestnuts was very apparent, overwhelming the gamy flavor of the sweetbreads. 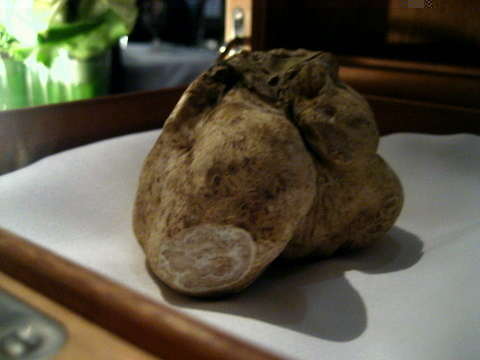 And the truffles, which were supposed to be a key element of the dish were only noticeable on the finish. The lack of balance and harmony really disappointed with this dish. The breast meat was fairly firm and moist but it was the dark meat that really stood out, tender and fatty the meat just oozed juice. I thought the pairing of foie gras would help season the breast but the foie was overdone resulting in a powerful burnt flavor that tended to obscure everything else. 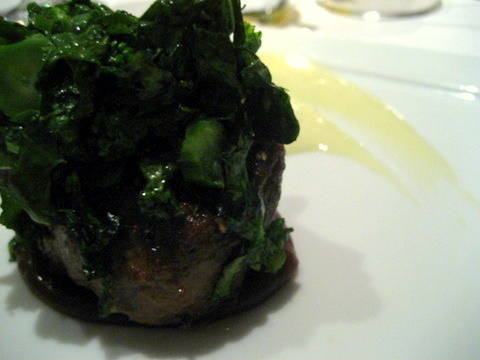 The venison was a little overdone resulting in a slightly dry firm texture but the use of mixed greens and a variety of sauces provided contrasting flavors that accented the venison wonderfully. 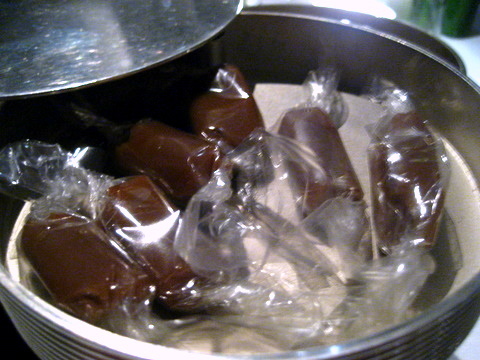 The desserts at Jean Georges are a bit different from other restaurants. 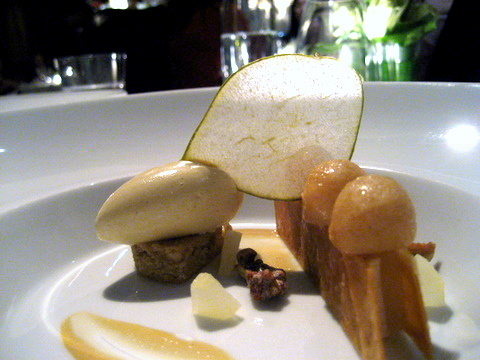 You pick a theme (Autumn, Apple, Caramel, or Chocolate) and receive four small desserts focused on your selected theme. 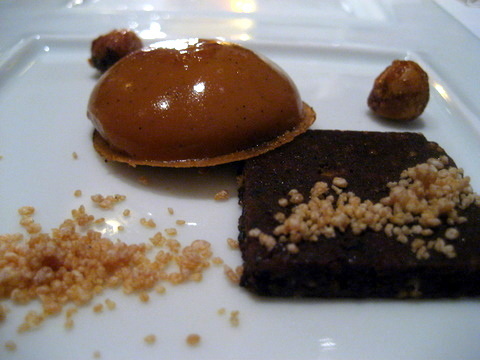 Warm Caramel Tart, Crispy Olive-Hazelnut Praline, Caramelized Bacon: The buttery sweetness of the caramel worked very well with the savory elements like olive and bacon. 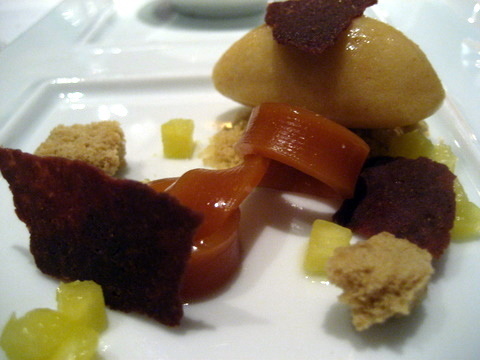 Caramel Curd, Dehydrated Sponge, Roasted Pineapple Sorbet: After the first dessert this seemed a bit muted but the tang of the pineapple and sweetness of the sponge were still somewhat apparent. 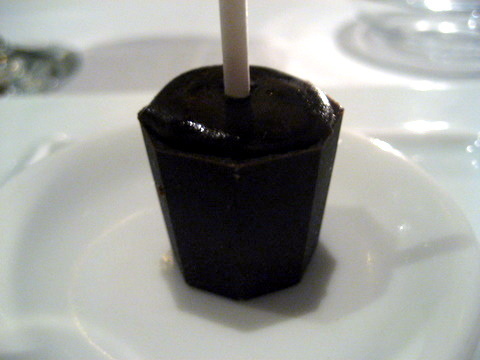 Frozen Chocolate Pop, Coffee-Cardamom Ice Cream: How can you go wrong with a chocolate lollipop filled with ice cream. 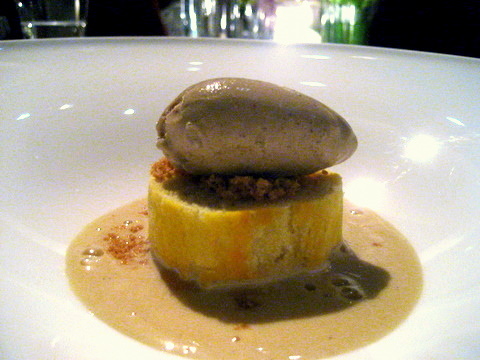 The Not sure what the caramel element here was but the coffee-cardamom ice cream was a wonderful filling. 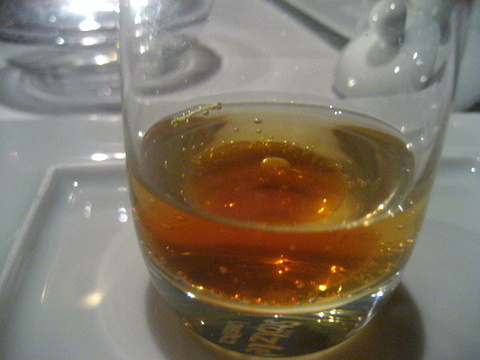 Vanilla Soda, Liquid Caramel Sphere: A fairly strong dessert ended on a whimper, the vanilla soda had a faintly medicinal or alcoholic flavor. 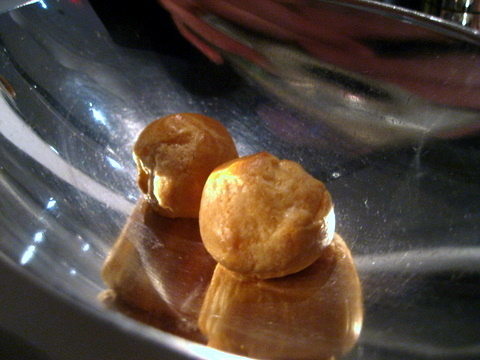 I expected the liquid caramel sphere to be similar to the spherifications of Adrià or Andrés but the caramel turned out to be very weak and didn't add much to the dish. 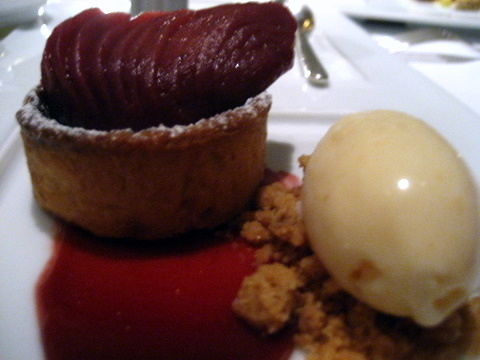 Warm Red Wine Tart, Cassis Poached Pear, Persimmon Ice Cream: I didn't care for this dessert, the tart was more like a muffin and the poached pear had a cloying overripe sweetness. Cranberry Parfait, Walnut Nougatine, Soft Vanilla Meringue: A much better dessert, with the fruit, nut, and vanilla blending beautifully. 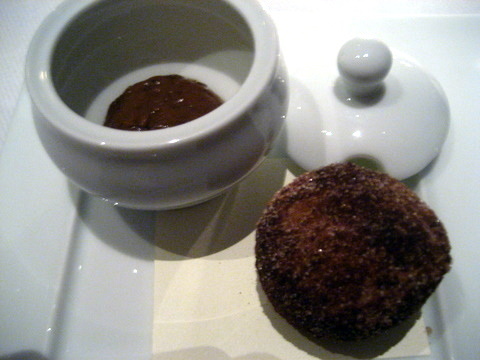 Cinnamon Doughnut, Prune-Armagnac Jam: A nice warm doughnut dusted with cinnamon, very much like a churro good with or without the jam, but not quite as distinctive as the beignet at Le Bernardin. 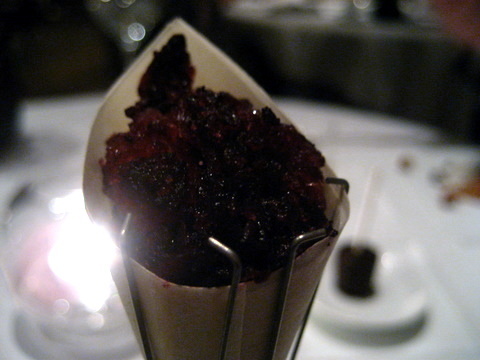 Concord Grape Snow Cone: I normally love the slick sweet flavor of concord grapes but after the intensity of the other desserts this tasted more like ice chips than grape. 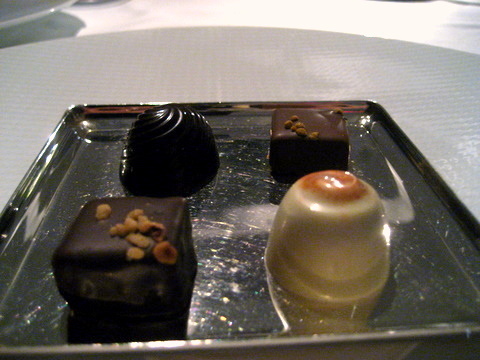 The restaurant provided a plethora of mignardises to nibble on after the meal but not one of them stood out. I would much rather have a few distinctive sweets similar to the ones provided by La Bernardin, much more innovative and memorable. 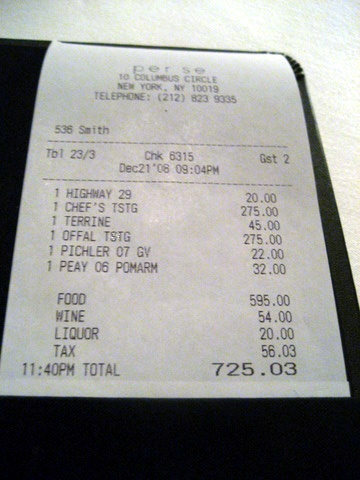 All things considered I was let down by my experience at Jean Georges. The staff can be a bit inattentive at times we had trouble getting the attention of the waitstaff on several occasions. The polite neglect can make the restaurant seem a bit cold and imposing. All this could be forgiven if the food were up to par. 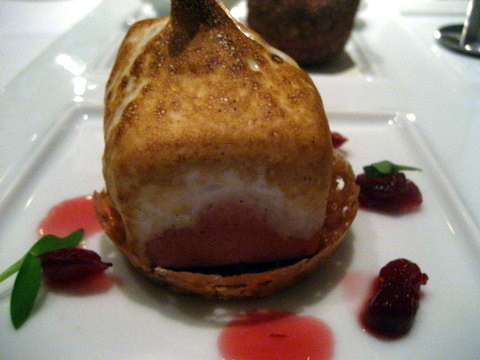 My past 3 star experiences have been revelations in dining, where I left the restaurant in utter awe of what I just ate. 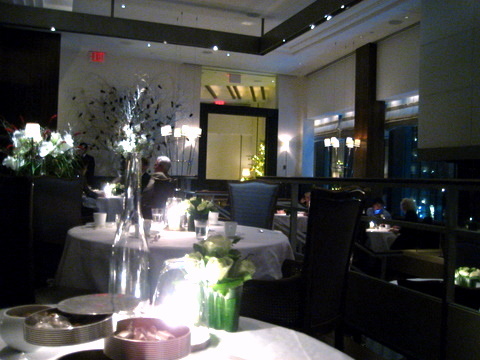 The food at Jean-Georges was good but did not leave me with any lasting impression.